Letter to F. W. Winter Company from The Berry Schools sending them literature about the Berry Schools. The letter goes into some detail about the history of the schools and their mission. The letter also informs them that they have student working in different areas on the campus to earn their way through school. The letter also informs them that the schools are in need of a belt sander for the wood shop and hope that the company would either like to donate one or quote them the lowest price. They also invite the gentlemen of the company to come visit the schools so that they can see the work being done. 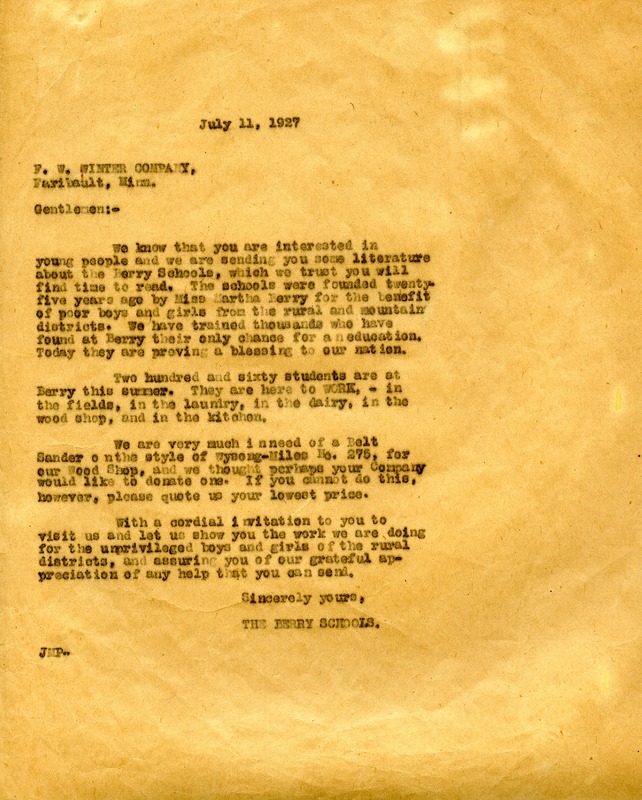 The Berry Schools, “Letter to F. W. Winter Company from The Berry Schools.” Martha Berry Digital Archive. Eds. Schlitz, Stephanie A., Haley Fortune , et al. Mount Berry: Berry College, 2013. accessed April 24, 2019, https://mbda.berry.edu/items/show/11417.